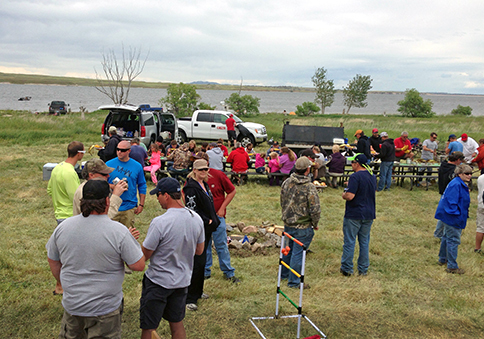 Laramie River Station employees, families and friends gather for a BBQ meal after the first IBEW 612 Basin Electric Employee Fishing Derby June 14 at Grayrocks Reservoir. 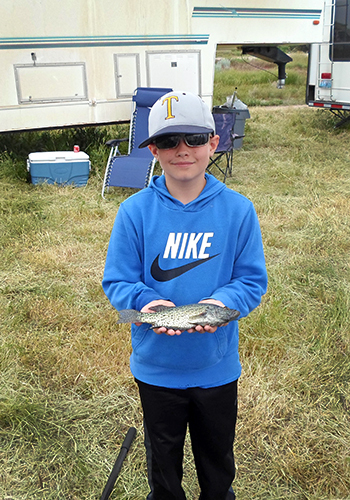 Laramie River Station mechanic/welder I, Greg Petroski’s son, Ryland, shows off his first place winning walleye. Laramie River Station employees, Greg Petroski, mechanic/welder I, and Kelly Simonton, maintenance supervisor, are hooked on fishing. They organized the first IBEW 612 Basin Electric Employee Fishing Derby to give their co-workers, friends and family an opportunity to practice their fishing skills while enjoying a friendly competition. The event was held June 14 at Grayrocks Reservoir near Wheatland, WY, and was open to all Basin Electric and Wheatland Rural Electric Association employees, sponsors, their guests and others. Fishing was supposed to begin at 6 a.m. that morning, but rain, lightning and even some hail put a damper on that. The weather cleared up by mid-morning and the fishing was back on. 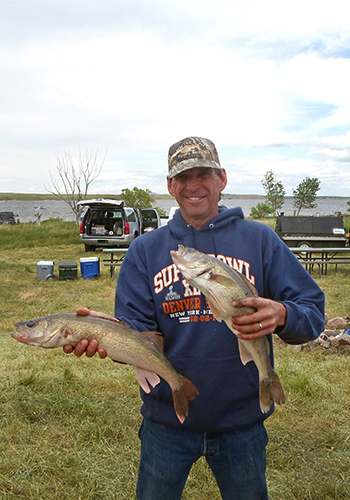 Ninety-eight entrants, including 12 youth participants, competed in the derby for the largest walleye. John Hennon holds his second place fish and John Worthington’s first place fish. This year’s derby was won by Jon Worthington with a 3 lb. 4 oz. walleye; Ryland Petroski won with a 1 lb. 6 oz. walleye for the youth division. “It’s fun to see the kids’ excitement. I know my son, Ryland, was looking forward to this tournament all year,” Petroski says. Participants paid an entry fee, Power Service, Inc., provided a BBQ lunch, and prizes were donated by sponsors. Basin Electric was one of those sponsors.